Psst! Detect cosmic rays with your smartphone! UCLA 11/3/2014—For years, astronomers have been puzzled by a bizarre object dubbed G2 in the center of the Milky Way that was believed to be a hydrogen gas cloud headed toward our galaxy’s enormous black hole, to be gobbled. Having studied it during its closest approach to the black hole in 2013 and 2014, UCLA astronomers believe that they have solved the riddle. Now UCLA professor of physics and astronomy Andrea Ghez and coauthors have determined that G2 is most likely a pair of binary stars that had been orbiting the black hole in tandem and merged together into an extremely large star, cloaked in gas and dust — its movements choreographed by the black hole’s powerful gravitational field. Their findings are published The Astrophysical Journal Letters. Astronomers had figured that if G2 had been a hydrogen cloud, it could have been torn apart by the black hole, and that the resulting celestial fireworks would have dramatically changed the state of the black hole. Instead, G2 survived and continued happily on its orbit; a simple gas cloud would not have done that. She says G2 suffered an abrasion to its outer layer during the close call, but otherwise will be fine. LBNL 10/28/2014—In an underground laboratory in Italy, an international team of scientists has created the coldest cubic meter in the universe. The frigid chamber—roughly the size of a vending machine—was chilled to 6 milliKelvin or -273.144 degrees Celsius in preparation for a forthcoming experiment that will study neutrinos, ghostlike particles that could hold the key to the existence of matter. The Cryogenic Underground Observatory for Rare Events (CUORE) consists of half a dozen nested evacuated chambers, each progressively smaller and colder. The cryostat maintained the record ultra-cold temperature for more than two weeks. 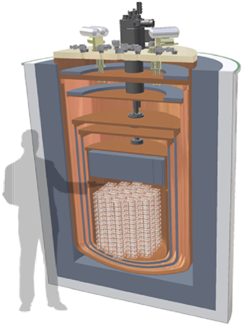 Ultimately, it will house a new ultra-sensitive detector to observe a hypothesized rare process called neutrinoless double-beta decay. Detection of this process would allow researchers to demonstrate, for the first time, that neutrinos are their own antiparticles, thereby offering a possible explanation for the abundance of matter over anti-matter in our universe—in other words, why galaxies, stars, and people exist in the universe at all. 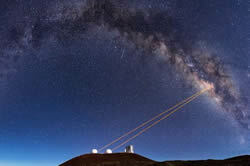 The Huan Tran Telescope in the Atacama Desert of Chile. The POLARBEAR microwave bolometers are mounted on the telescope to study the polarization (twisting) of light from just 380,000 years after the Big Bang to determine when dark energy, the mysterious force accelerating the expansion of the universe, began to dominate and overwhelm gravity. UCB 10/21/2014— An international team of physicists has measured a subtle characteristic in the polarization of the cosmic microwave background radiation that will allow them to map the large-scale structure of the universe, determine the masses of neutrinos and perhaps uncover some of the mysteries of dark matter and dark energy. In a paper published in The Astrophysical Journal, the POLARBEAR consortium, led by UC Berkeley physicist Adrian Lee, describes the first successful isolation of a so-called “B-mode” in the polarization of the cosmic microwave background radiation produced by gravitational lensing. Polarization is the orientation of the radiation’s electric field, which can be twisted into a “B-mode” pattern as the light passes through the gravitational fields of massive objects, such as clusters of galaxies. NERSC/UCSC 10/17/2014—A team of astronomers from UC Berkeley, UC Santa Cruz, and the National Energy Research Scientific Computing Center (NERSC) at Lawrence Berkeley National Laboratory has created the first map of the “adolescent” universe as it appeared just 3 billion years after the Big Bang. The three-dimensional map, which spans millions of light years across, provides a tantalizing glimpse into the large structures of the “cosmic web,” which form the backbone of the cosmic structure in the universe. It is the first time the cosmic web has been mapped at such a large distance, 10.8 billion light-years away. The map reveals early stages of cosmic structure formation during an era when the galaxies were undergoing a major growth spurt. 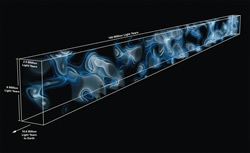 The map was reconstructed by a novel technique: using the light of distant background galaxies passing through the cosmic web’s hydrogen gas. This concept is similar to a medical CT scan, which reconstructs a three-dimensional image of the human body from the X-rays passing through a patient. NASA Ames 10/17/2014—A team of scientists investigating the mysterious, fog-like transition layer of the Sun are combining observations from NASA’s Interface Region Infrared Spectrograph (IRIS) satellite with running high-resolution simulations on the agency’s Pleiades supercomputer to gain a more complete picture of our nearest star. One of the team's findings confirms the existence of magnetic loops in the Sun's transition region—the area between the 1 million°F corona (outer atmosphere) and the much cooler 20,000°F chromosphere, near the surface. Gigantic magnetic loops that span tens of thousands of miles had often been seen in the Sun’s corona, but not in the transition region. They had also been seen in movies generated from numerical models run on NASA’s Pleiades supercomputer (currently the ninth fastest system in the U.S), but the scientists thought they were a fluke—some flaw in the model. But within a few days after opening the telescope aboard IRIS in July 2013, they “saw tiny little loops popping up all over the place.” Details of the IRIS science team’s discoveries are reported in a special section of the 17 October issue of Science. UCI 10/13/2014—Psst! Wanna be a coauthor? Make your smartphone part of the world’s largest telescope. Two physicists from UC Irvine and UC Davis designed an app to turn the global network of smartphones into a planet-sized cosmic ray detector, according to a paper posted to the physics website arXiv. A long-standing puzzle in astrophysics is the source of ultrahigh-energy particles from space that hit Earth. Called cosmic rays, they’re up to a billion times more energetic than particles at CERN’s Large Hadron Collider. They strike the atmosphere and cause an enormous shower of other particles, mostly muons, electrons and photons, over a wide area. Although discovered decades ago, the highest-energy cosmic rays are very rare, making it difficult to pinpoint where in the universe they originated. But they can be captured by technology in smartphones’ cameras. The app, dubbed CRAYFIS (Cosmic Rays Found in Smartphones), collects data when the phone is connected to a power source and has not been used for several minutes, in order to not interfere with normal phone usage or drain battery levels. If an individual’s phone gathers data used in a scientific paper, he or she will be offered authorship. The app can also run in anonymous mode. UCSB 10/13/2014— Is matter falling into the supermassive (4 million solar masses) black hole at the center of the Milky Way or being ejected from it? Carl Gwinn, a professor in UCSB’s Department of Physics, and colleagues have analyzed images collected by the Russian spacecraft RadioAstron, launched into orbit from Baikonur, Kazakhstan, in July 2011. One of its missions was to investigate the scattering of light from pulsars—the cores of dead stars—by surrounding interstellar gas. Sagittarius A* (pronounced A-star), the source that marks the Milky Way’s central black hole, is visible from the gas around it at radio, infrared and X-ray wavelengths—wavelengths also scattered by the gas as light is scattered by fog on Earth. Gwinn and his colleagues found that gas has lumpy substructure, which could be used to infer the actual size of the underlying source. Their findings appear in The Astrophysical Journal Letters. A friendly international race is going on to see who will be the first to determine whether gas falls into the black hole or is being ejected in the form of a jet.